Bob Derderian joined us April 11, 2019. He is below with supporting Knights from our Council. The Knights left to right are Joe Marandola, Bob Derderian, (1st), Michael Brown, Kevin O’Connor, and Paul McEneany. Ryan Knisley joined our Council on October 17, 2018. He is below with supporting Knights from our Council and the District Deputy. The Knights left to right are.Joe Marandola, Ryan Knisley (1st), Kevin O’Connor, Michael Brown, Tony Chigbolu (District Deputy), and Paul McEneany. Two Knights join on January 10, 2018, They are shown below with supporting Knights from our Council. The Knights from left to right are Joe Marandola, Manny Aguliar (1st), Guillermo Prada-Silver (1st), and Dr. Charles Ettari. Three Knights join on June 14, 2017, They are shown below with supporting Knights from our Council. 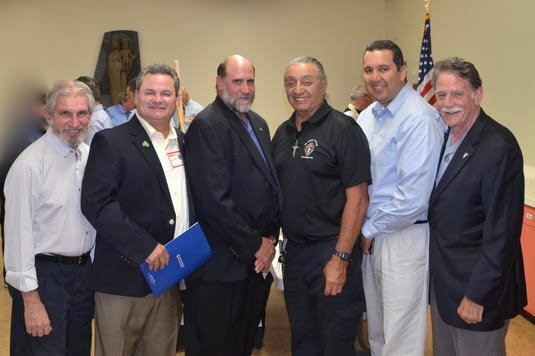 The Knights from left to right are Joe Marandola, Jaime Barton (1st), Bruce Scott (1st), Al Gonzales, Raphael Rodmel (1st) and Paul McEneany. Three Knights join on May 10, 2017, The Knights below are Kris Van Lom (1st), Phillip Turner (1st), and Joe Hawkins (1st). We were pleased to have four new brothers join our council. The following men joined us on Wednesday, May 11th, 2016 and were supported by current Knights. The full list is below. From left to right they are:Joe Marandola, Spencer Schreckengaust (1st), Kevin O'Connor, Bruce Mullin (1st), Fr. John Howard, Ken Howard (1st), Todd Davis (1st), Jorge Fernandez. New Brother Ken Howard is the adopted son of Fr. John. The 1st degree exemplification was outstanding.